Researchers have discovered two genes that make some strains of harmful Staphyloccocus bacteria resistant copper, a potent and frequently used antibacterial agent. Researchers found the two genes in some strains of S. aureus bacteria. The genes protect the germs from copper, which is increasingly used in the global fight against severe infections. The Staphylococcus aureus bacterium—a leading cause of serious and life-threatening infections in the United States—is highly resistant to antibiotics. Some strains of S. aureus have newly acquired genes embedded in their genome in pieces of DNA called transposons. DNA can be transferred from one organism to another, and transposons help the acquired DNA rapidly become a permanent part of the recipient’s chromosome. This process likely contributed to the recent North American epidemic of staph infections, according to Jeffrey M. Boyd, study senior author and associate professor in the biochemistry and microbiology department in Rutgers University’s School of Environmental and Biological Sciences. 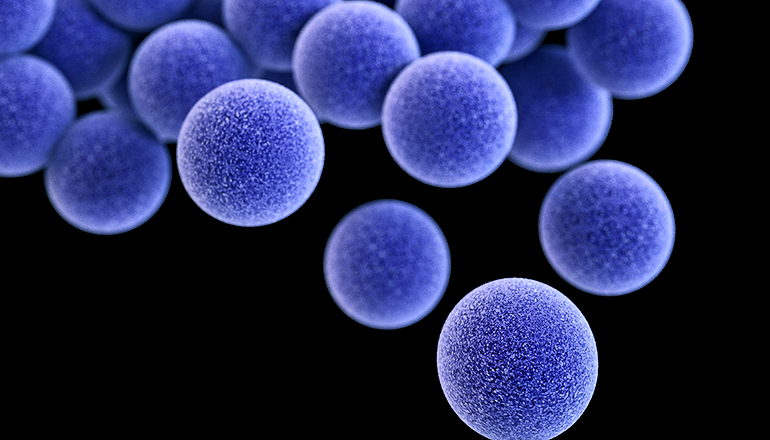 The genes may promote the survival of S. aureus in settings, such as in hospitals, that could lead to infections. The researchers also revealed the 3D structure of the copL protein in the B. subtilis bacterium, a relative of S. aureus, using nuclear magnetic resonance methods. Researchers also used those methods to identify the area where copper binds to the surface of the protein. “This structure provides the basis for rational drug design and could lead to a novel path for antibacterial drug discovery,” says coauthor Gaetano T. Montelione, chair of and a professor in the molecular biology and biochemistry department. Additional researchers who contributed to the research are from Rutgers and the University at Buffalo.